Cuphead players have recently uncovered how to unlock a secret black and white mode that truly takes you back to the golden age of cartoons. If you have had the pleasure (or pain) of playing any of the run-and-gun levels in this stress inducing indie game from Studio MDHR then you’re probably well aware of how challenging they can be. From spitting trees to walking flowers, a regular day in the life of Cuphead and Mughead is definitely no walk through the park. Typically you’ll approach each run-and-gun mission with the objective to shoot at everything and anything that gets in your way, but if you want to unlock the secret black and white mode then you’ll have to ease up on that trigger finger. 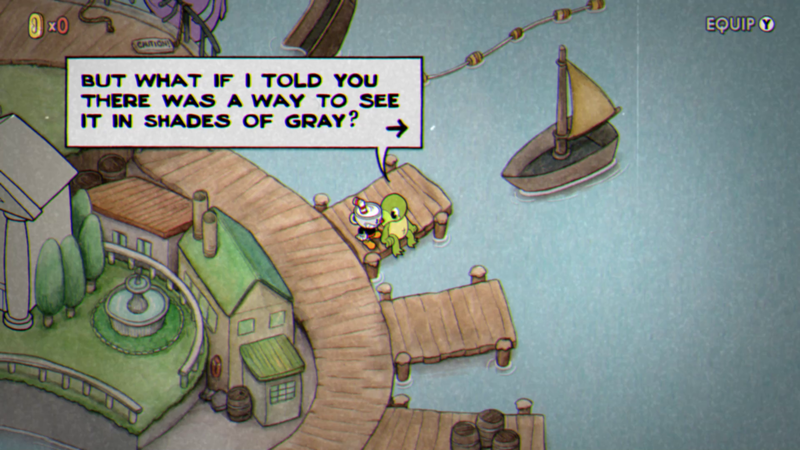 To unlock the black and white mode in Cuphead, you’ll have to pay a visit to the turtle sitting on the docks in the World 3 hub. He’ll talk to you about pacifism, alluding to a secret achievement. If you can complete all the run-and-gun levels without killing any of the enemies and can make it back to the turtle to tell him about it, he’ll provide you with the black and white filter along with an audio filter. With these two bonuses in hand, you’ll finally get to experience the game in all of its monochromatic vintage glory. It’s worth noting that using your dash, parry, and Invincibility Super abilities will not disqualify you from your pascifist quest. When a platforming level has been completed correctly in this way, it’ll be marked with the letter P on the report card at the end. There are plenty more secrets to uncover in Cuphead that include more filters and secret bonus levels. Look out for more Cuphead guides on The Game Save and we hope unlocking black and white mode was well worth it!